I wasn’t much of a wine drinker before moving to California wine country a few years back. Since then I’ve discovered I mostly like the red stuff and I like it to not burn while going down, but otherwise I’m still not sure what to choose among the myriad of options on the menu. Next Glass is a new beer and wine recommendation app that uses science to determine if you will like a certain bottle of booze. Using a what it calls the “wine genome cellar” and machine learning, the scientists behind the app have tested the chemical compositions of thousands of brewskis and bubblies throughout the country to help you choose your next beverage. The higher the score from 0-100, the more a certain bottle is going to supposedly knock your socks off. It’s now out on the App Store until tomorrow afternoon. Next Glass certainly has entered into a competitive area. Hello Vino, WhatWine, Drync, Vivino and possibly a hundred others will give you wine recommendations on your smartphone. Though fewer in number, there are also some beer apps such as BeerCloud or The Beer Bible. But what Next Glass aims to do is add intelligence based on a scientific breakdown of elements within the wine and beer. That is different from just a recommendations engine. 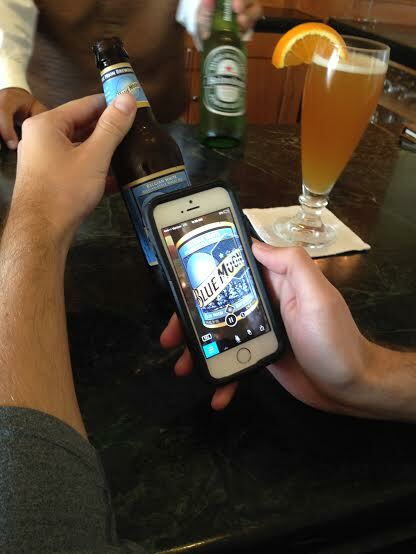 I grabbed a few cold ones with COO Trace Smith while in Laguna Beach this last week to see how the app worked. To be honest, it’s a bit of an arduous process to first set up your taste profile. The app makes you swipe through a number of different bottles of wine and beer. It chooses those bottles for you. That’s not really helpful if you’ve never tasted any of them before. I had not tried most of the ones it forced me to rate before being able to use the app. Next Glass also didn’t have several of the bottles I had tried before in the search portion. I’m not entirely sure the recommendations I currently get are accurate because of this. Smith explained how Next Glass uses the “wine genome cellar” to set itself apart from all the other apps out there. Scientists on the team continue to add to this chemically sequenced database of wine and beer so users can get those recommendations on the app. Smith tells me to think of it as a sort of “Pandora for alcohol. The goal is to get every bottle sold in the U.S. into the database eventually. That’s going to be a mother of a task, but Next Glass is determined to do just that. Founders came up with a way to add thousands of beer bottles as fast as possible before launching the beta version of the app at least. Beer Census 2014. Next Glass rented a moving van and took it across America this summer to buy up every variety of beer they could along the way. So far they’ve been to 642 breweries, collected 15,350 bottles and tested over 12,452 of them. 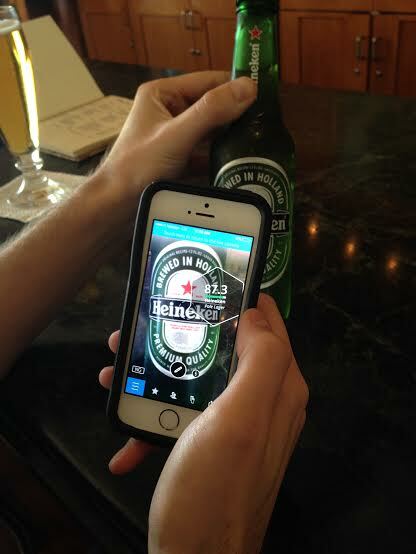 Smith and I grabbed a few bottles of beer and started scanning so I could see how it worked before the app came out. “This one I like a lot,” he says, swigging back some Heineken and showing me the score of 87.3 on his phone. Most beer tastes like sudsy, liquid bread to me. Still Smith encouraged me to try it. I’m still not a fan of that one. However, I did find out through the app that I might like the darker, chocolatey stuff. The app uses machine learning to figure out what you like as you scan and rate more bottles over time. It also incorporates social features so you can see if your friends on the app like or dislike a certain type of libation (handy if you are bringing something to the party). Something I like about the the app is that it provides the caloric content of each glass. It can also recommend a less expensive bottle of wine that tastes an awful lot like a pricier one. It simply cross-references the chemical compositions and then let’s you know it’s practically the same thing. Next Glass can also give you a “hangover rating.” It claims to have figured out a way to let you know how likely it is you’ll wake up with a headache if you drink something. I didn’t try to test out if this is true but do let me know if you do. The real application of this app isn’t that it potentially takes the guess work out of alcohol or that it caters to your own, personal tastes, it’s that it could use science to break down chemical compositions and make a predictive analysis about something your tongue will like. This can surely be applied to much more than just alcohol. Why not recommendations for cereal or perhaps vegetables your kids might like? Smith hinted that the company would expand beyond beer and wine, but that this was the major focus for now, “It’s a big area and we definitely have our work cut out for us in just the wine industry alone.” Smith told me as we sipped different varietals on the counter of the Laguna Montage hotel. The roadmap ahead includes an expansion of the database and inclusion of a wider array of spirits such as whiskey and vodka, according to Smith. But to be honest it seems pretty hard to get all the bottles in the whole country into one app in a timely enough manner to make it the number one wine and beer recommendation app. Opening up the database to other chemists or wine and beer labels is probably not an option, but there are hundreds of thousands of different types of wine and beer and more coming up all the time. Smith and his co-founders Kurt Taylor and Forrest Maready have raised a healthy seed of $3.8 million from undisclosed angel investors so far. Perhaps Next Glass could hire more alcohol scientists and trucks to help speed up the process.